Thinking about refreshing your bathroom? Unsure what the latest bathroom trends are? European Bathrooms’ lead designers, fresh from their trip to ISH, Germany – the world-leading bathroom trade fair - have put together an expert guide covering the latest bathroom collections and colours for 2017. If you’d like some more inspiration, call into one of our modern Amersham or Windsor showrooms. Hot on the heels of Villeroy & Boch’s 2016 coloured bathroom suites, accent shades are back again this year but this time with a metallic twist. Whilst Villeroy & Boch’s Artis, Loop and Squaro 2016 range featured snow white ceramics with candy coloured exteriors, the designer has upped the luxury factor even further by adding a variety of steel, silver, gold and copper coloured accessories and finishes to their bathrooms. Villeroy & Boch’s Finion collection is the epitome of bathroom luxury, comprising delicately curved washbasins, baths, bathroom furniture and metallic coloured taps, bath and shower fittings. If you’re seeking a stunning centrepiece, the Finion free-standing bath has the option of a decorative metallic strip and subtle LED lighting around its base – giving a ‘floating’ effect. Luxurious metallic accents continue in Villeroy & Boch’s new Antheus collection. White ceramic washbasins and baths are supported by polished stainless steel. Whilst other materials, such as, marble and wood add an extravagant yet earthy feel. If you’re looking for a seriously stylish and soothing sanctuary, come and browse our Villeroy & Boch range in-store. Time to shine - Villeroy & Boch’s Finion collection includes a sumptuous free-standing bath with metallic accessories. Although recessed niches in showers and above baths are still popular in bathroom design, in 2017, the niche is coming out! 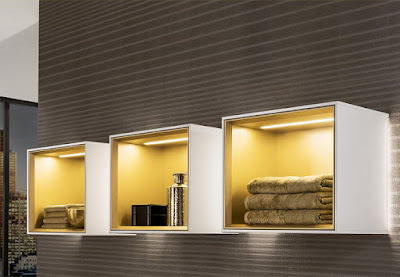 Instead of in-built shelving, designers are favouring surface mounted niches. This is put to stylish effect in the Finion’s ‘box collection’ - a series of atmospherically lit, floating box shelves. As well as looking amazing, the boxes are perfect for storing extra fluffy towels and favourite bathroom products. The Finion Box Shelves come in a range of matt and gloss colours. The integrated soft lighting gives your bathroom real ‘wow’ factor. Minimalism reigns in modern bathrooms and it is still a principle design element this year. Latest bathroom collections feature elegant, ultra-thin washbasins inset or mounted on floating vanity units – ideal for storing bathroom products out of sight. WCs are wall-mounted to emphasise their clean lines and maximise space. Bathroom mirror cabinets are recessed (built into the wall) to give a ‘barely there’ appearance and shower trays are so slim, you can glide rather than step into the shower. If you’re a fan of minimalist design, we have a wide range of sleek designs on display, including fittings, mirror cabinets and accessories from Keuco’s Reflex 2, Royal 15 and Lumos line. Like minimalist design? 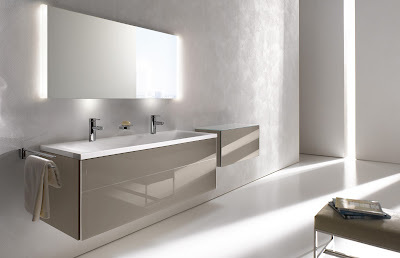 You’ll love Keuco’s stunning bathroom ranges. Pictured is a sample of Keuco’s Reflex 2 collection. Large format tiles in natural finishes are making a big impression this year. As well as leading designers Villeroy & Boch adding more oversized tiles to their lines, we’ve seen an increasing number of clients opting for large format tiles. Large format tiles, particularly in lighter colours, are ideal for giving the illusion of space. They work just as effectively in small bathrooms and shower rooms, as larger spaces. Bathroom tiles most in demand have a matt finish, for example, natural stone tiles, marble tiles and concrete tiles. Villeroy & Boch’s Newtown tiles have a natural finish with a subtle traditional design. Get the bathroom you’ve always dreamed of. For bathroom ideas, and to browse the latest collections, come and talk to us at European Bathrooms, Amersham and Windsor’s best bathroom designers, suppliers and installers.